Understanding the basic principles of heating systems is essential to selecting the proper heating system for your application. Please Note: Multi-positional style furnaces are designed for ALL installation applications and required minimal conversion. 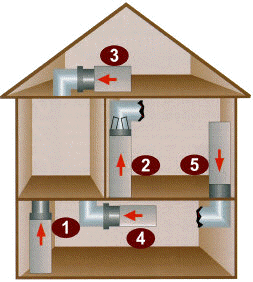 The type of the furnace is determined by the fuel source that runs or operates the furnace. 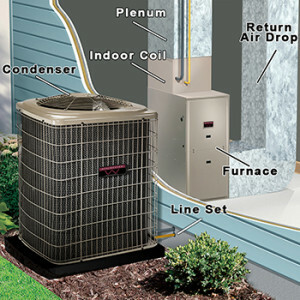 Select either natural gas, LP gas (propane), oil or electric. For natural gas or LP (propane) fired furnaces, choose between an 80% standard efficiency furnace or a high efficiency 95.5% furnace. Forced air electric furnaces are also available, as well as 80% efficiency oil fired furnaces. You can refer to an estimate or proposal from a local contractor, refer to the size of your existing system that you may want replaced, or use the sizing estimation chart listed with each furnace type within this website. A properly sized furnace will ensure your comfort. Therefore, it is important to never undersize. Always go to the next larger size if necessary. Oversizing by more than 20% can negatively effect the efficiency and operation of a furnace. Please Note: When sizing equipment for mobile home applications, refer to the data plate located in the electrical panel or kitchen cabinets. For further assistance, contact Hamilton’s customer service department. Arrange for your own installation or for maximum installation savings, do all the non-technical preparation and have a certified technician perform the final connections, start-up and check test. All Federal, State and local Codes must be adhered to. Installation manuals and warranty information may be obtained from the product pages of this website, or by visiting our “Equipment Manuals” page. Hamilton administers the manufacturer’s warranty in accordance with their policy and procedures. Hamilton must be called prior to any warranty parts or service. Copies of the warranty can be obtained from the product pages of this web site, or by visiting our “Equipment Manuals” page. DO NOT RETURN EQUIPMENT to the Home Center. Should you need technical or troubleshooting assistance, email or call Hamilton’s Hotline at (800) 879-0123.